alaTest has collected and analyzed 80 reviews of nabi Big Tab HD 24". The average rating for this product is 4.2/5, compared to an average rating of 4.3/5 for other products in the same category for all reviews. Opinions about the durability and screen are generally positive. The battery and usability also get good opinions. Many are less positive about the portability, while opinions are divided on the price. We analyzed user and expert ratings, product age and more factors. Compared to other products in the same category the nabi Big Tab HD 24" is awarded an overall alaScore™ of 85/100 = Very good quality. Amazon.com review summary for nabi Big Tab HD 24"
alaTest has collected and analyzed 26 user reviews of nabi Big Tab HD 24" from Amazon.com. The average user rating for this product is 3.8/5, compared to an average user rating of 4.1/5 for other products in the same category on Amazon.com. 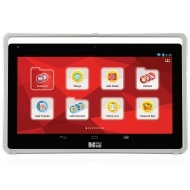 Fuhu Nabi Big Tab HD 24"
The gargantuan Fuhu Nabi Big Tab HD offers both a collaborative, kid-safe Android experience and all-in-one connected media chops. A massive 20- or 24-inch tablet that feels more like an all-in-one, and it runs Android 4.4. What is this crazy thing? It's the Nabi Big Tab...for kids. The Nabi Big Tab is awesome. Since we have 4 kids this is the perfect way that they can all play and not cause a big fight. The only downside is the battery but we don't let them take it anywhere so leaving it plugged in is no big deal. Great games available and good for all ranges.